Yeah, Leo's voice sounds much better in this version. Thanks again for all the feedback guys, I always enjoy reading your thoughts. I know some of my cast members lurk around here too and they REALLY enjoy feedback. Alright, guys here's the Donatello micro! I think this is my favorite of all the one's I've worked on so far. This issue has loads of fun dialogue and our Donatello (played by the incomparable Eric Shonk) really brought his 'A' game. I'm really proud that I am part of this! I'm really happy with everyones performance in this! It was so much fun to record for this! You and everyone involved should be. This is one thing I anxiously await every other week. Great job. Nice SFX on the Mousers. Another well done episode. Do you plan on doing any of the minis like "infestation" and such? I just binge-watched everything from Raph's micro up to the most recent issue. You guys are doing a phenomenal job! The sound quality is great, the delivery is perfect and the voices for each character just feels right. I love checking out every video. Technogeek29/Machias Banshee - Thanks so much for your continued enthusiasm and feedback it's much appreciated. I've been so lucky to find the cast members that I have, they're incredible talents and nice people to work with. I've been able to make a lot of good friends working on this series. Sabacooza: No plans for "Infestation" at the moment, but as you know we're doing the micros as we go along and we'll also be doing "Secret History of the Foot" and "Utrom Empire." I hope you'll look forward to those with anticipation. 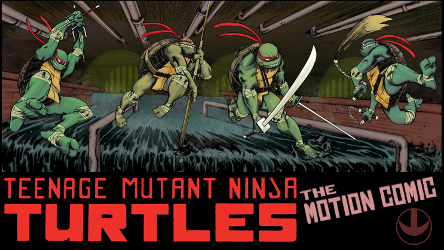 And now, who's ready for TMNT #8? And now, a personal favorite of mine: The Leonardo Micro. Yeah, this one was awesome. The ambient sound for this one was especially good. I don't know. I always loved the sound of rain so maybe that adds to it. Again, thanks for sharing. I'm really loving these. Very nice! I agree with the background noises, it definitely brings you into the story more. Nice work Desslok! Keep em coming! Was waiting for the verbal spat in the Van.